We began the second Sunday of Advent yesterday and it's been awhile since I've updated my little corner of blog land here. I last posted about St. Cecilia's feast day on Nov. 22, then there was Thanksgiving (which was a blessing, despite our little one spiking a fever the night before Thanksgiving Day), then we had to deal with my 3 year old getting over being sick and coughing a lot and using our Kleenex box supply on her one tiny runny nose. :) Before I knew it, it was the first Sunday of Advent on November 27! Life is busy and life is full to say the least. I've been updating my blog's Facebook page often and Instagram and Twitter accounts so sometimes the blog gets the back burner for many reasons. 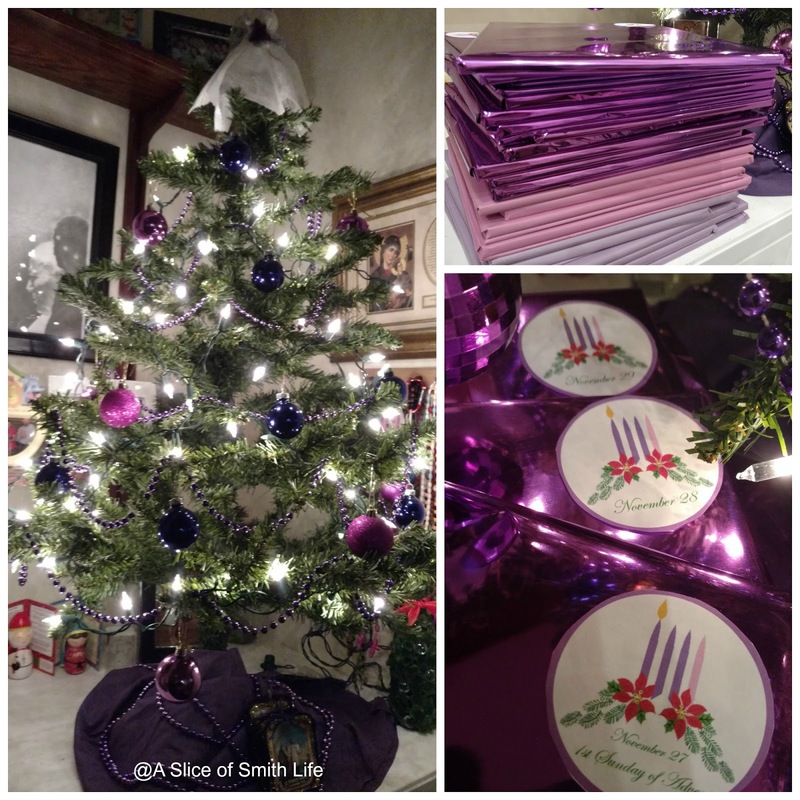 Last year I listed many Advent traditions we do as a family and we are doing many of them this year. 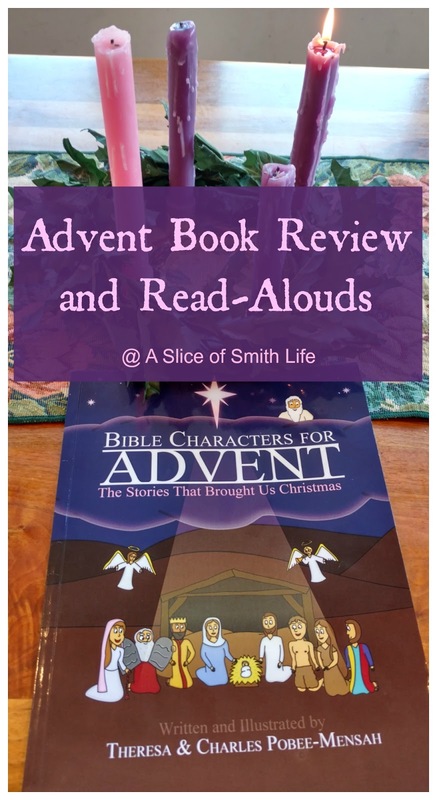 On this post I wanted to share a new Advent book with you and list many of the Advent book read-alouds we use as a family. I was first introduced to Bible Characters for Advent: The Stories That Brought Us Christmas because the authors and illustrators, Theresa & Charles Pobee-Mensah, are related to a friend of mine that I have known for several years. Theresa and Charles were inspired to write this book because of the birth of their son (who was born on the first Sunday of Advent) and they wanted to "instill a Christ-centered focus in their Christmas tradition." This is the first Advent book I've read that focuses on 25 Bible characters. Each chapter is short and a 2 page spread with brief information about the character and stories from Scripture that relate to the character. With colorful, eye-catching illustrations this book appeals to young children, but even my older children and my husband and me enjoyed looking at the fun illustrations. This book is only 58 pages long, which as a busy homeschool mom juggling a lot during Advent, the length is perfect and not overwhelming! The book covers the more well-known characters such as Adam & Eve and Noah to maybe some characters we often don't hear a lot about like Jeroboam and Rehoboam. Here are a few photos I took of the inside so you can see how the book is laid out. 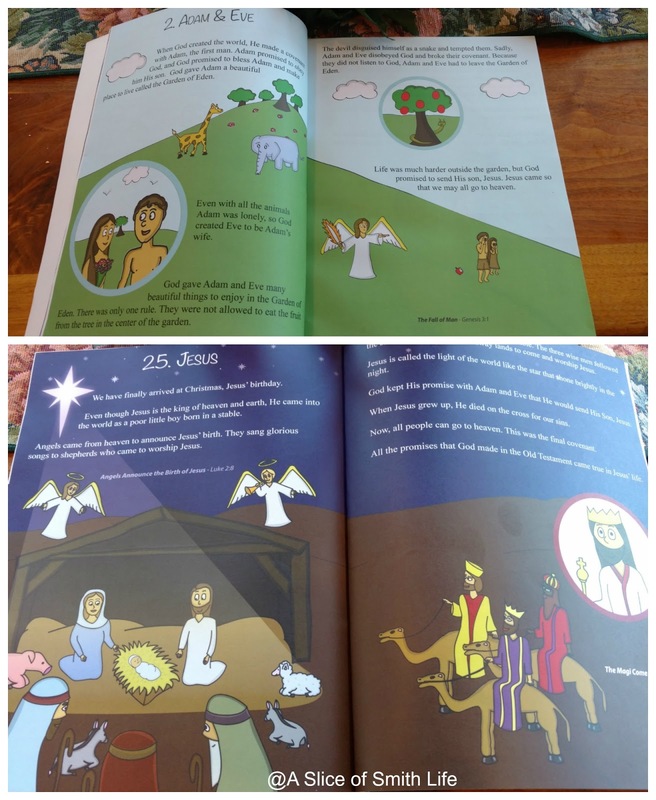 I especially liked that each Bible character's page has a reference to where you can find the story in the Bible, which encourages parents and children to connect this book with actual Bible stories and the faithful fun can be extended by finding the Scripture passage in your Bible. In the Introduction Theresa and Charles give suggestions on how to read their book. Since there are twenty-five characters that lead to Christmas, the authors state "you can read one each day starting on December first, or you can read a few at a time." Bible Characters for Advent: The Stories That Brought Us Christmas would make a great addition to your home and/or church library and it's a fun, meaningful way to have your children become familiar with biblical characters that center around the Advent season. Be sure to Meet the Authors on their website My Jesse Tree. On Theresa and Charles' site you will find more information about their book, the Jesse Tree, printable Jesse Tree ornaments that go with the readings in the book and be sure to visit My Jesse Tree Shop that includes adorable My Catholic Saint magnets! My Jesse Tree is a wonderful resource and treasure chest to start or add to your Advent traditions and Bible Characters for Advent: The Stories That Brought Us Christmas is one of many treasures you can find there! Thank you Theresa and Charles for sharing your gifts and love for our faith, family and Advent in such fun and meaningful ways! Speaking of great books to read during Advent, we are continuing with our wrapped Christmas book tradition that we started many years ago where I wrap one Christmas book from our personal collection in purple/rose paper and my children take turns opening the books each day. Here is our small, artificial Advent tree we put up on the first Sunday of Advent. I found my purple and rose decorations at the Dollar Store many years ago, but I recently found purple ones and rose ones on Amazon. I also find purple and rose wrapping paper each year at the Dollar Tree. The books wrapped in rose paper are those that will be read during the third week in Advent when the rose candle is lit on our Advent wreath. I printed, cut and taped on the printable labels onto each wrapped book from Jessica at Shower of Roses. Other read-alouds that our family also enjoy are a series of books by Arnold Ytreeide. We don't read all the books each Advent, rather we choose one book and read it, then the next year we pick another book to read in the series. We have been rotating these books for many Advent seasons now. 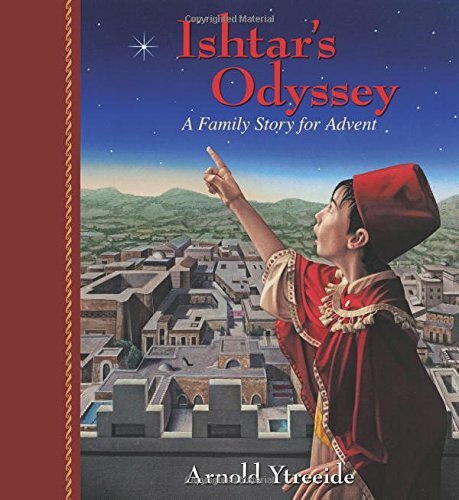 This year I bought the newest book in the series titled Ishtar's Odyssey that we are currently reading. These family stories for Advent are definitely books my entire family enjoys hearing me read each night. Each chapter ends with a cliff hanger usually so my teens and even my husband always want me to read more than one chapter each evening. These book are also interesting because the author weaves in the main character from one book into another book. I highly recommend these stories as family read-alouds during the Advent season! 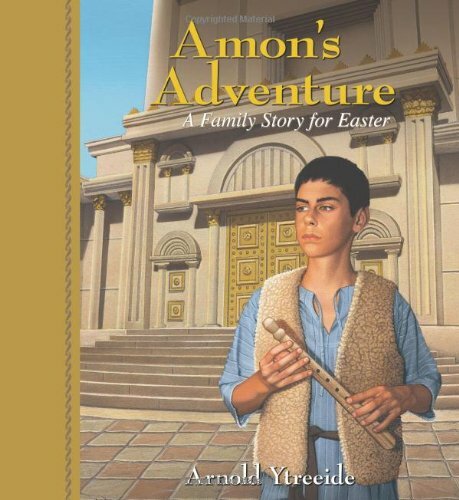 As a side note, during Lent, just before Easter, we enjoy Amon's Adventure: A Family Story for Easter by the same author as the Advent stories. I hope some of my suggestions will help make your Advent traditions more memorable and faith-filled. Enjoy the rest of your Advent season! I never thought of that idea! Best wishes for you and your family for a blessed, healthy Advent amd Christmas! Oh...and for your little one... Have you ever tried Boogie Wipes?! They work so well for little noses! Love this book list and, despite the MANY books our family reads each Advent I have found a few new titles on it. "New" to us, not to the world, though. Looks like some are OOP. Are there any of these books you'd highly recommend over others, and, if so, which and why?